Yet another project, one in which I will finish because I have a deadline. A few weeks back, Dr. Brook Wilson, one of our two veterinarians, came and did some acupuncture work on Tinni. At the conclusion of her visit, I asked her if when she returned on her January 3, 2018 visit, if she might show me a few things. She seemed receptive to the idea, so in preparation I decided to learn as much as I can about acupressure, which is the counterpart to acupuncture. make my own manual, one in which plastic page inserts fit into a binder. This way, I can take the clear pages out and use them in working on the horses. And if I lose a page or a page gets dirty, I can easily print up another copy since I am drawing up the documents on the computer. 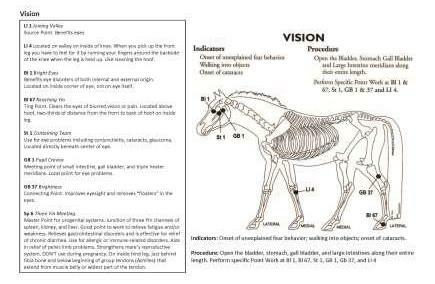 I first went to a website and found a drawing of a horse with the parts for the Lung Meridian already labeled. It was a good drawing in that it was two-dimensional. I took this drawing and printed it up and hand wrote the written information from one of my books. Last night, couldn’t sleep, began thinking that I might be better off putting in the data on the computer. I next asked Pete for a hand, and he obliged. We sort of worked together on this, this morning. The problem is usually that he is Mr. Whiz Bang – he moves quickly when working on the computer and so I can’t follow what he’s doing. So I end up giving up. There are a LOT of acupressure points meaning that there is a lot of data. So I am learning as Pete works, in a very piecemeal fashion. I am hoping by the time I finish this project that I can do a few more computer-related things. Taking on another project when I have others to finish up is a bad idea. Not was, is since I am doing this now. But I am determined to have a big chunk of it done when Brooke visits. If all goes as planned, she will be able to show me the acupressure points that will best help Mr. Tinni. I can then write them down and make a chart for Tinni. This way I can continue his treatments after she leaves. I am confident that I can at the very least alleviate the pain that Tinni must be experiencing in his left eye. The last treatment was good in that the drainage went from being puss-like to watery. Tinni might also be arthritic, so this might also help him on this front. I don’t have aspirations to do this sort of work on other horses. I think that this is best left to practitioners who do this sort of thing all the time. But I do aspire to learn as much as I can and draw upon what I learn in working with Tinni, Raudi, Hrimmi, and Tyra.